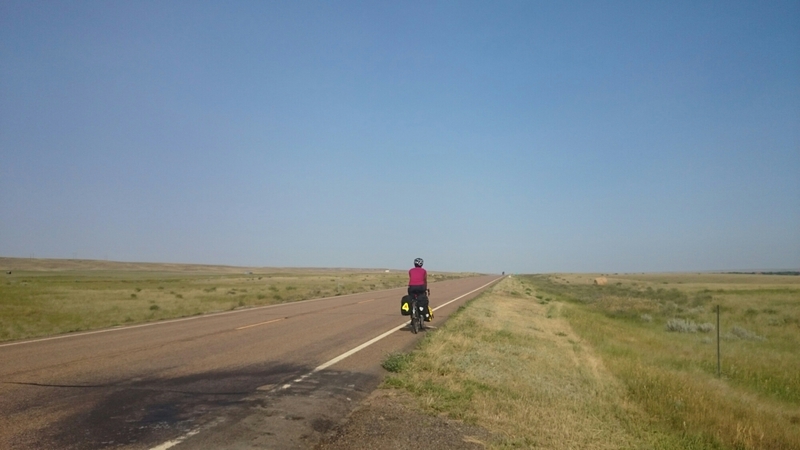 Day 27, Malta, MT to Glasgow, MT: 71 miles, 1,357 ft. elevation gain, 9.5 mph average speed. Today’s synopsis is similar to yesterday’s, except I’d add headwind, hills, mosquitoes, and another hot. Today was the most miserable day since that 105 degree day into Eureka, MT. Also, sorry about the lack of photos. I was too hot and tired to bother with the phone. We ended up turning down Terry’s exceptionally kind offer to drive us 26 miles up the road to Saco. You should be proud of us; this was hard to do and we sort of regretted it later. Terry gave us bagels and fruit for breakfast (thanks for feeding us so well, Terry!) and we got started early in hopes that we’d avoid the headwind and heat. After 17 miles of rolling hills, we made it to Sleeping Buffalo, a sacred rock that I wish I could tell you more about, but I can’t because the moment we stopped there we were swarmed by mosquitoes. It was like something out of a Loney Tunes cartoon. We immediately applied our bug spray–our cruelty-free, all natural, citronella-based bug spray–and the mosquitoes didn’t give two craps about it. They were flying through the bug spray stream in search of blood. It was an ambush. A lady pulled up and told us that we were entering the mosquito flats (which are actually the Saco Flats, but are known for their mosquitoes) and it would only get worse for the next 13 miles through Saco, which aligned perfectly with Terry’s warning. The mosquitoes can’t really bite us as much when we’re moving so we pushed on to Saco. A headwind had started while we took our break. We started regretting passing up that ride at this point. We continued regretting that decision for the rest of the day. 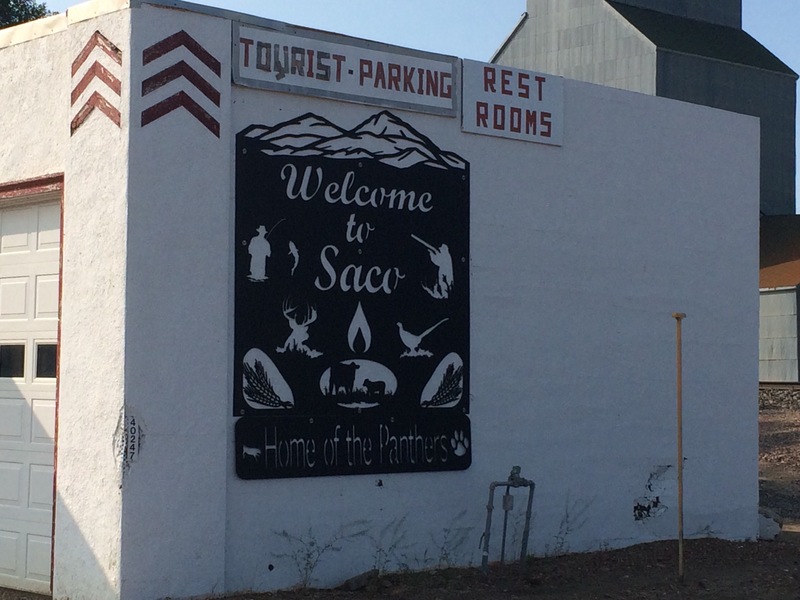 Terry gave us another amazing tip: there’s a butcher in Saco who cures his own meats and sells them in the grocery store in Saco. He wins all of the meat curing awards Montana has to give away, so this meat is apparently not to be missed. We stopped at the store and the lady working there was super friendly. She even opened a package of meat so we could try some (it lives up to the hype!) and she gave us the rest of the package for free! A bunch of people stopped in the store and grabbed armfuls of this meat and told us to stock up, that they come from 30 miles away just for this meat, etc. We bought as much meat as we could carry and a gallon of lemonade and stood outside to eat our second breakfast, consisting of that gallon of lemonade, Bloody Mary-flavored beef sticks, and Peanut Butter Oreos (a breakfast staple, naturally). As an aside: I’m really into the fact that I get to eat all of my guilty pleasure food in disgusting quantities and I’m not gaining 100 pounds. I hope I’m able to wean myself off when we’re not riding bikes all day. We started toward Nashua against that headwind and the terrain flattened out a bit. 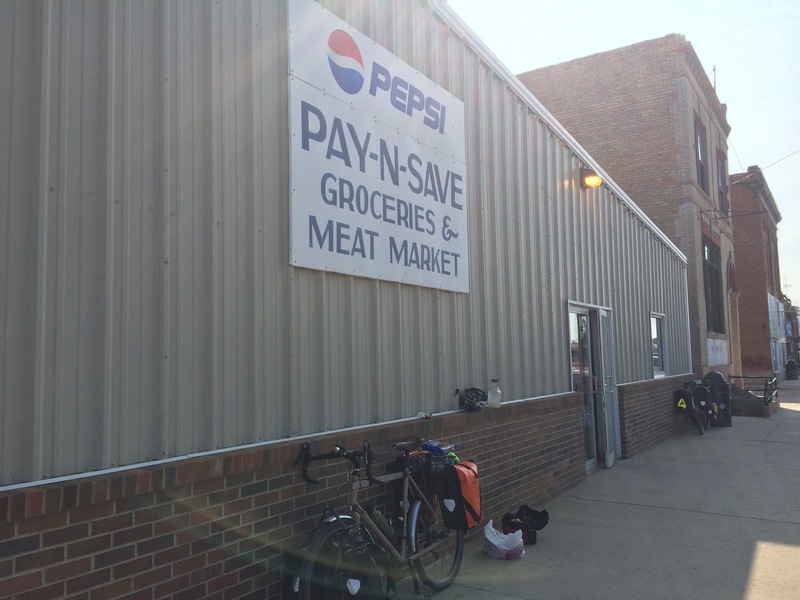 After 14 exhausting miles we entered Hinsdale, another small town with a convenience store where we bought Gatorade and sat at a table inside to escape the heat. An older local man was sitting at the table holding his dachshund and another man was drinking a coffee. We talked to them about the weather (i.e., complained about the heat and headwind) and left as soon as they told us the headwind gets worse throughout the day. Not soon enough, though. The riding was miserable between Hinsdale and the rest stop 15 miles away. We were pooped by the time we reached the rest stop and decided to stop short of our goal destination, Nashua, at Glasgow, which was only 15 more miles. We scarfed down food, guzzled water, and I somehow managed to fall asleep on a concrete picnic table bench. That’s how exhausting it was. Ted woke me up and had already packed up lunch and refilled our waters. What a sweetheart! Letting me sleep while he works! He is really carrying me through this trip. I would still be in Glacier if it wasn’t for him. The wind and heat had both gotten worse, of course, so we really struggled through the final 15 miles. It took what felt like an eternity. The hills felt like personal insults and the winds sometimes stopped us in our tracks. We stopped at the first convenience store in Glasgow and bought cold drinks, then proceeded to the city’s civic center to see about camping in the city park. We found out that it was free to camp and there were dollar showers at the rec center around the corner. We quickly showered then got on our bikes in search of wifi. 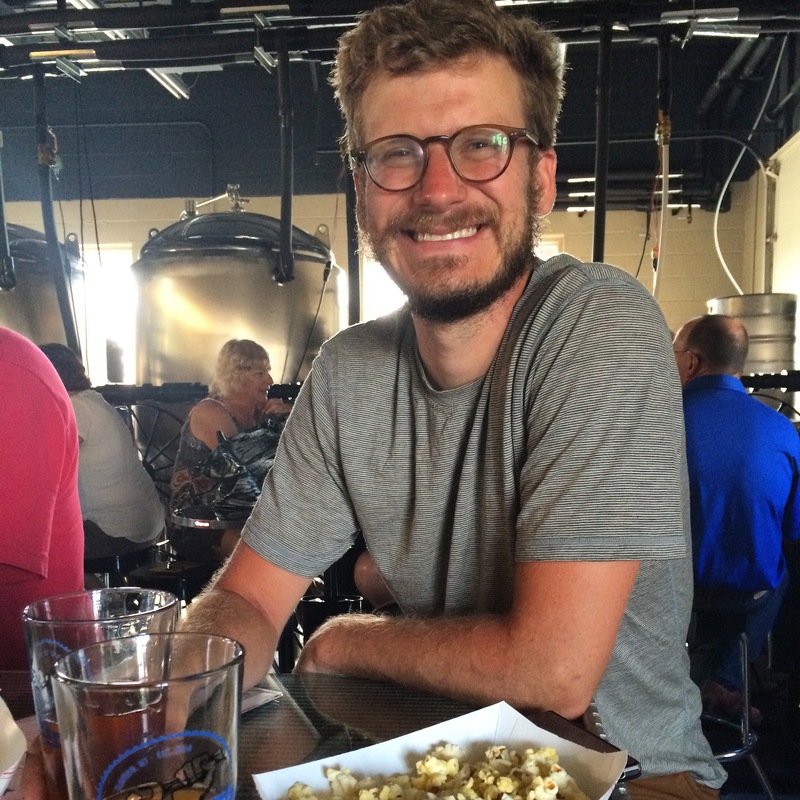 We found a recently opened brewery, searched for and found a wifi signal, then went in to drink beer while updating blogs. But there were too many friendly people inside who wanted to chat so we were not productive. Two of the people we met, Tanja and Mike, invited us to have dinner with them at a new Mexican restaurant in town. The food was delicious and the company was lovely. Tanja is a meteorologist, so it was also a very informative dinner. Among other things, she explained our headwind predicament. Apparently there’s a low pressure system in the Rockies and it circles the winds counterclockwise and up. Should end on Sunday or Monday, so that’s good news. She also said that these winds are pretty common and that it’s documented that Lewis and Clark complained about the wind, too. At least we’re in good company. Mike is into cycling, and we’re hoping he tries out touring someday. They ended up treating us to dinner, which was so kind. We are meeting the most wonderful people on this trip. Montanans, on the whole, have been particularly kind. Tanja warned us about a rain / wind storm tonight so we’ll get to really test out our new tent!